I have a love hate relationship with blogging. It comes in fits and spurts. I genuinely love writing, so blogging seems a natural hobby to have. Except that it isn’t. Most days, thinking of a blog post feels like hard work. I already have enough on my plate with trying to think of words to put into my second manuscript now that my first is out on submission. I also deal with words most days of the week through my day job, and when I’m not working in one capacity or another, I’m probably trying to tackle my ever growing TBR (To Be Read) pile. I know I’m not the only writer to suffer from these problems, and really it’s not a problem in the grand scheme of things. Yes, having an active blog would make my engagement as a writer and potential author easier. I would probably be able to grow my audience if I posted more regularly and that would mean more people to know about and buy my book when (not if) it eventually comes out. I’ve just never been one of those people who can blog when there’s nothing to say. It takes a certain level of training to be able to think up and fire off creative writing every day. The other thing I have been putting my focus towards lately is a course in Copywriting through the Australian Writers Centre. For a long time I’ve fancied that one day I will quit my ‘normal’ job and go out on my own as a freelance writer. The only thing is, as aforementioned, I don’t seem to have the stamina for thinking up and evidently pitching idea after idea to publications, in order to make any sort of living. That’s a bit of a problem if I ever want to freelance. In truth, I like that I channel my creative words into my novels. It’s what I am most passionate about. I also really enjoy reworking other people’s words. I always have. (Maybe it’s that little bit of control freak in me?) In another life, perhaps I would have pursued a career in editing, and maybe I still will. I have such a keen eye for detail that I actually enjoy proofreading and editing other people’s work. I don’t consider myself a perfectionist, but I do like to read good quality content. Sloppy mistakes hurt my soul – but hey, we ALL make them. I’m not about shaming people if they don’t have a strong grasp on grammar or have a tendency to make silly mistakes. If everyone was perfect there’d be no reason for editors. And I love editors. 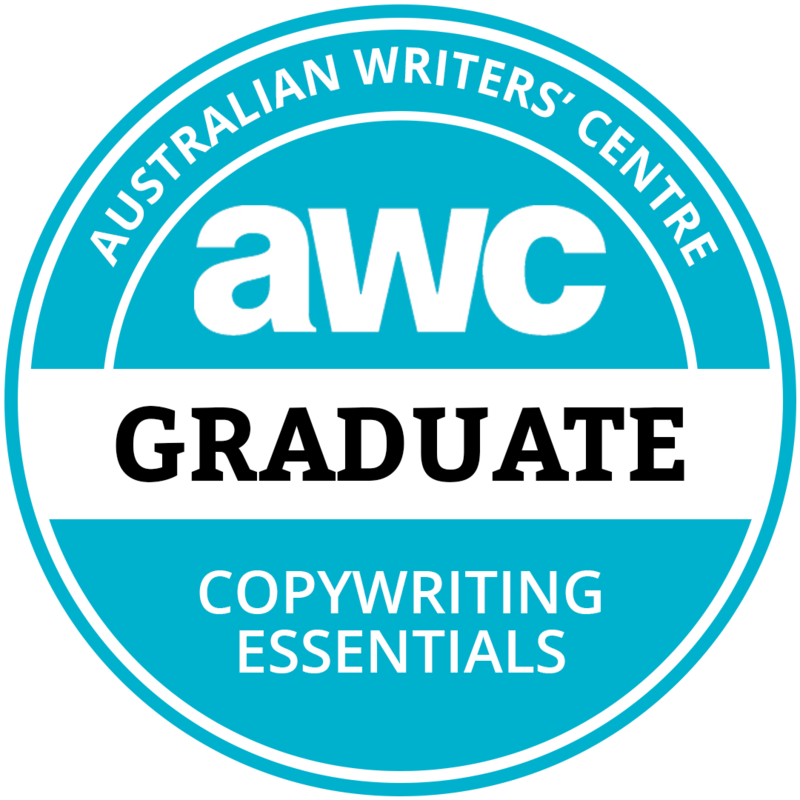 When I saw the copywriting course advertised through AWC, I thought why not give it a go? It’s creative writing, but with the theme/facts already at hand. No need to scrounge around thinking of the angle or the story. It’s about taking the facts and presenting them in an interesting and saleable way. We are actually surrounded by copy. It’s in just about everything we read and look at every day. That brochure on the table of a coffee shop, the annoying pop up internet ads, newsletters, blog posts, traditional ads, they’re all copy. Surely I’m not the only one who gets annoyed when copy is riddled with mistakes or simply doesn’t sound right? A good copy writer will be able to take a creative brief and pull something together that a client will want to use. I’m hoping that’s what this course will give me. The skills and confidence to put myself out there and get behind all that copy we see day to day. After all, I’ve been perfecting other people’s copy for more than a decade now. It’s about time I started writing it myself. If you’d like to know more about copywriting or any of my other freelance work, contact me here. I couldn’t agree with you more about having a love/hate relationship with blogging. I really enjoy writing blog posts, but only when I feel I have something to say. I don’t ever blog just for the sake of it, and if that means I have a smaller audience, I’m fine with that. I try to make novel writing a priority. I’ve thought about copy writing, but maybe not until I’ve given novel writing everything I possibly can. Good luck – I’d love to hear how the copywriting goes, and best wishes for your novel out on submission! I feel like you could be writing out of my own brain. I was like, yes, I don’t have as much time as I’d like to write blog posts and I can never think of what to blog about. And also yes, I want try copywriting. And also yes, I love editing other people’s work. I should do that course. It’s on my list! All the best – I’m sure you will make a great success of it. I think it’s particularly hard for creative people/writers, because we want to make a living out of what we love, but the reality of that is, it’s very difficult! So we look for a bunch of different ways to make it work. I reckon it’ll work out for us both in the long run (maybe when the babies are in school! Ha).